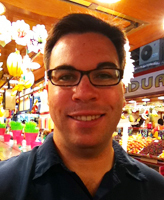 Adam Asher Duker, a graduate student in the University of Notre Dame’s Department of History, has been awarded a 2012 Fulbright to Switzerland, along with a Bourse de la Confédération Suisse. The Fulbright U.S. Student Program funds up to a year of research and study abroad in more than 140 countries. Approximately 1,000 winners are selected each year, based on their academic and leadership potential. Advised by Brad Gregory, Dorothy G. Griffin Professor of Early Modern European History, Duker’s dissertation explores the intellectual, cultural, emotional, and psychological facets of Christian identity during the French Wars of Religion and the Savoyard siege of Geneva. Duker’s research examines how different confessional communities understood themselves through the lens of the Hebrew Bible, and how the meaning this Israelite identity changed along with the fortunes of Catholic and Protestant armies during the course of the religious wars. Duker will spend the 2012-2013 academic year at the Institut d’Histoire de la Réformation (IHR), which is housed at the Université de Genève. The Meyer Prize is awarded—not necessarily every year—for the best research paper presented by a graduate student or assistant professor at the previous meeting of the SCSC. The prize includes recognition in The Sixteenth Century Journal, and the opportunity to publish a revised version of the conference paper in the journal.